Buy 1 for $17.67Buy 2 / Save $0.94!Buy 3 / Save $3.53! Although sage is known in North America primarily as a flavoring for food, this perennial herb with gray-green aromatic leaves has a long history of medical use, especially in Europe. Sage is a member of the mint family and native of the Mediterranean region. Its scientific name, Salvia, comes from the Latin word for "to mend." At various times, sage was regarded as a virtual panacea. Commission E doesn't consider sage a panacea, but does verify its useftulness. Commission E recommends sage leaf and preparations derived from sage leaves for helping support inflammation of the mucous membranes of the nose and throat. Sage can also be used for helping support dyspepsia and for drying up excessive perspiration. In Germany, a sage-based commercial preparation called "Salvysat Burger" is marketed as an antiperspirant. Sage contains tannins whose astringent properties help account for its use in Germany as support for sore throat, bleeding gums, and canker sores. In food preparation, sage, like rosemary, has antioxidants that help keep food from going rancid. Sage's powerful taste and smell come chiefly from camphor, one of its prime constituents. Commission E, without cit ing sources, credits sage with having antibacterial, antifungal, and antiviral powers. Sage may help support healthy blood sugar levels as well. A 1950 study published in Germany reported that blood sugar levels in test subjects were cut in half when they took liquid sage decoctions on an empty stomach. More study is needed to investigate this encouraging possibility. For internal use: Commission E's recommended daily dosage is 4-6 grams of dried sage, 2-6 drops of essential oil, 2.5-7.5 grams of a liquid extract, or 1.5-3.0 grams of liquid extract. For external use: in a gargle or mouthwash Commission E recommends 2.5 grams of the herb; for an infusion; 2-3 drops of essential oil in 100 milliliters of water; for an alcoholic extract, 5 grams in 1 glass of water. 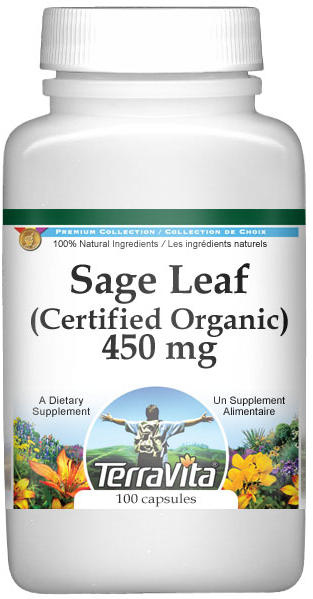 Sage leave is the best drug free product I know to prevent hot flashes. I BOUGHT THE SAGE LEAF PILLS TO SEE IF IT WORKED THE SAME AS SAGE TEA TO DRY MILK UP AFTER PREGNANCY AND WAS SURPRISED THAT IN LESS THAN ONE WEEK I WAS DONE. I CAN HONESTLY SAY IM FLOORED BY HOW WELL IT WORKED SEEING HOW I HAD A BABY 20 MONTHS AGO AND IT TOOK 3 WEEKS OF PURE PAIN! !